IDEAL for a stay of any length, this bright and beautiful 2 bedroom apartment is thoughtfully decorated with a Southwestern flair. The versatile living room includes a formal desk and chair for work, and a large, comfy couch, chairs, and several extra cushions for lounging on the newly carpeted floor while reading, resting, visiting, and/or watching HD cable TV. The cute, practical kitchen is open to the living room, separated only by a multipurpose counter with stools tucked beneath for easy storage. The kitchen is well-appointed to serve a wide range of eating/cooking needs. The appliances include a full-sized refrigerator/freezer, a full-sized microwave oven, a convection-toaster oven, a conventional toaster, an automatic coffee maker, and an induction-heated hot plate system. A dishwasher and disposal are also included. The large bathroom has double sinks, lots of drawer and counter space, and a full-sized tub and shower. It is stocked with lots of thick towels and is located between the living room and the bedrooms. A full-sized washer and dryer, complete with laundry supplies, are conveniently tucked into an alcove next to the bathroom a few steps from the bedrooms. Both bedrooms provide privacy and a restful sleep on new memory foam mattresses.One bedroom has a queen bed and the other has 2 twin beds. Dressers are available in both bedrooms. Both bedrooms, as well as the living room/kitchen area, have large windows that look out to a private, walled flower garden. The occasional chirp and creak of wooden floors overhead will remind you that there are people living above you. Your private outdoor space furnished with a table and adirondack chairs is a short, few steps up from your entrance. The flagstone patio is decorated with blooming flowers and plants three seasons of the year. One off-street parking space is provided and located steps from the apartment. There are 4 steps down to the apartment entrance and it is not wheel-chair accessible. Additional free, on-street parking is available. Access to bus transportation to all parts of the city is one block from the property and can be utilized to reach most destinations within Albuquerque. 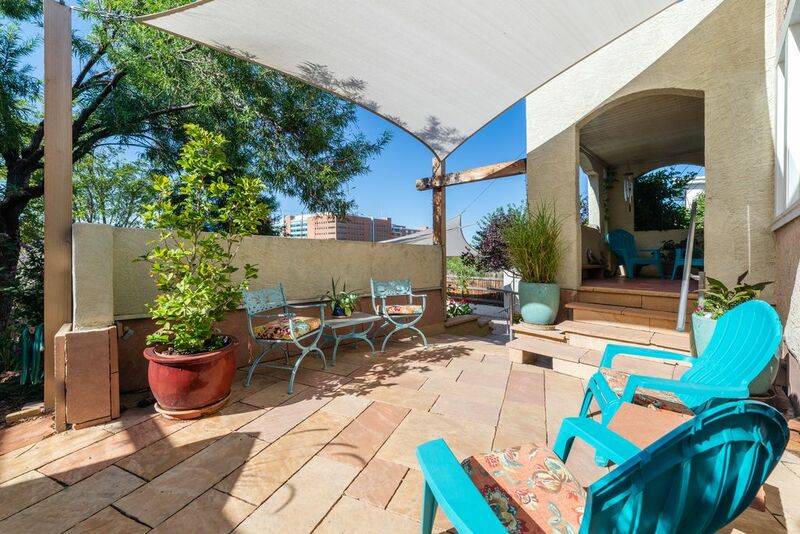 Whether you are vacationing, relaxing, visiting family/friends, passing through, or working in the Albuquerque area, this comfortable and cozy 2 bedroom jewel is just right for you! My name is Jan and my husband is Richard. I am a teacher with a passion for working with elementary and middle school children. I love to read, cook/bake, walk, travel, garden, and entertain. Richard is creative, talented, and outgoing and loves to build things, problem-solve, work hard, and play tennis. We love New Mexico and have lived here for over 40 years. Friends and family are our most important assets. We found each other and married 19 years ago, and between us we have 4 grown children and 10 grandchildren. We look forward to sharing our knowledge of New Mexico, this beautiful land of enchantment. Richard bought and moved our wonderful 1920's bungalow to its present location 20 years ago after finding out it was to be torn down to make room for nearby hospital expansion. At that time, he decided to construct a walk-out floor below because the design fit perfectly with the slope of our lot, and that resulted in a two-story house with our home on the top floor and a fully functioning, separate walk-out downstairs. Friends and family occupied the walk-out until last year. We love to stay at B&Bs and VRBOs and decided to remodel the walk-out and give VRBO ownership a try ourselves. The bathroom has two sinks, a large vanity and many storage drawers under the vanity counter top. It has a shower and a full-sized tub. There are many racks and hooks to hang towels and clothes. Downtown Albuquerque is a 5 minute westward drive or convenient bus stop ride away. UNM is 5 minutes east. All hospitals within 5 minutes. Bustling Nob Hill shopping and restaurants 5 minutes, too. Your own furnace is controlled by an adjustable thermostat. Linens include 2 complete sheet sets for each bed, including the 84" couch that serves as fifth bed. Extra pillows and blankets are available. A washer & dryer are provided in the the apartment. One off-street, driveway parking space is provided. More on-street parking available. Wifi. Password information upon check-in. Many towels are provided. Make-up removal cloths are provided. A washer & dryer are provided in the apartment. Perfect for reading, working, studying, watching TV/movies, listening to music, visiting, napping, & overnight sleeping with versatile couch, chairs, lamps, cushions, desk, tables, & privacy curtains. Dishwasher works well and is simple to use. Full-sized two-door refrigerator. Ice cube trays are provided to make ice. Not equipped with a traditional stove and oven. Equipped with a very adequate one burner heat induction system, electric skillet, microwave oven, and toaster oven. Not equipped with a traditional stove and oven. Equipped with a full-sized microwave oven and a very adequate toaster oven to bake small items and frozen foods. An automatic coffee maker with filters and a manual teakettle. A new, four-slice toaster plus a new toaster oven. Full set of spices, coffee filters. Fully stocked with service for 6 (glasses, bowls, small & large plates, flatware). A few plastic bowls, cups, plates. A teakettle and a few pots and pans plus all necessary cooking utensils. Includes everything you need to prepare full meals. See individual kitchen and dining amenities. In kitchen, table seats 2-4 with 2 additional seats at the bar that separates the living room from the kitchen. Folding chairs are available for extra seating. Includes premium channels including several movie, history, science, and kids' channels. Netflix also included. Fiction and nonfiction books about New Mexico plus local information publications. Outdoor front patio with chairs and small table surrounded by plants and free-standing privacy walls. Small pond and fountain complete the patio. The apartment has many features designed to increase your safety and peace of mind, such as an outer locking heavy-screened security door, smoke alarms, carbon monoxide detector, locks on bedrooms, an emergency information card, and an industrial first aid kit. The apartment is additionally protected by a simple-to-use, armed alarm system should you choose to use it. We spent three nights in this light and wonderful apartment during our recent trip to Albuquerque. It is perfectly kept, amply spacious, and incredibly pleasant and comfortable, with many conveniences. It's an easy trip into downtown Albuquerque, including the convention center. The two ample bedrooms were great for the three of us - one couple and a friend - and would be equally comfortable for Four. Jan and Richard provided basics (and a bottle of wine) so when we arrived we didn't have to run out to get supplies. The apartment itself is great, and their hospitality made our stay even better - Jan gave us helpful information on goings-on and things to do in the area, and Richard provided good restaurant advice (there are many close by) and even called us to let us know about a traffic jam on the highway on the day we planned to travel to Acoma Pueblo.. The apartment is also within easy walking distance of the University of New Mexico campus, which is worth a visit itself and is surrounded by college-oriented shops, restaurants, and book stores. The apartment would be perfect for a family doing their college tours. In all, it was a lovely stay - if we get back to Albuquerque, we'll hope to stay there again. What a wonderful home away from home! Conveniently located in central Albuquerque, Jan and Richard have created a welcoming space filled with color, light, and Southwestern decor. A huge plus for my asthma was the strict no-pet policy and Jan's use of unscented products whenever possible. I wondered if the lack of stove/oven would be a problem, but it was not. Microwave, portable induction cooktop, electric skillet, coffee maker, electric kettle, full size refrigerator, etc., were plenty for my needs. Comfy beds, large tiled bathroom, and high efficiency (HE) washer & dryer were perfect for an extended stay. Highly recommended! Loved the location, area was charming, perfect space for what we needed, host super nice in providing snacks, maps, reading etc. did have some overhead noise from walking upstairs but was not loud enough to truly disturb us. would recommend. This is our second time staying at this exceptionally comfortable apartment. It has everything you could need and is centrally located. We will be renting it again next year. We really enjoyed our stay at the Casa Central. It was perfect for four of us to enjoy the Balloon Fiesta and central Albuquerque. The home is spacious and bright with comfortable beds, a beautiful bathroom with double sinks and a hot shower, and a kitchen adequately stocked with everything you need (although we ate out most of the time). We appreciated all the extra amenities supplied such as lotion, shampoo, towels to wash off makeup, and everything was very well marked. We especially enjoyed the welcome basket with wine, chips and salsa, and the provided coffee and fresh cream. The outdoor veranda was a favorite place to enjoy a glass of wine and here we had great conversation with the owners who gave us excellent tips on places to eat and shop. Our favorite was Duran Central Pharmacy! We’ll definitely stay again the next time in Albuquerque. This was a quiet and comfortable place to unwind each evening after our day trips sightseeing stunning New Mexico. Jan and Richard are welcoming and hospitable and have included many touches to make their guests feel as if they are at home. They were available to answer any questions and gave fabulous recommendations for restaurants or local "don't miss"sites. We felt their warmth and sincerity throughout our stay. Thanks for sharing your place with us. Interim cleaning is available for longer stays. We request that long-term guests have the apartment cleaned every 2 weeks during their stay. Speak with Jan or Richard to arrange it.